The choice of stress variables controlling the behavior of unsaturated soils has been a challenge for geotechnical engineers for more than half a century and in particular in the last two decades. Many researchers in the world are still working on this aspect and Professor Eduardo Rojas is one of them. There are two main approaches: the first one considers two stress variables, generally the net stress (σ – ua) and matric suction (ua – uw); the other considers a single stress variable, generally called the effective stress. However, this latter approach generally shows deficiencies in reproducing the phenomenon of collapse under wetting. In several technical papers and in this eBook, Professor Eduardo Rojas has developed a porous-solid model that considers micropores, macropores and their connections, and the fact that they can be saturated, unsaturated or dry. This model is very powerful and allows the determination of the Soil-Water Retention Curve on both the drying and the wetting paths. This model is also the key for the determination of an equivalent effective stress that allows the analysis of the different aspects of the mechanical behavior of unsaturated soils: compression, strength, tensile strength and volumetric behavior. Application of the model to experimental results published in the literature gives remarkable results. Was it necessary to put this information into one eBook? The answer is yes, as it shows in one document the continuity from the physical model and the definition of an equivalent effective stress to the practical applications. Did the eBook provide a final response to the questions concerning representative stress variables for unsaturated soils? Probably not, but it gives a very consistent approach of the problem within the context of the existing literature and knowledge. It is a reference for all those interested in the behavior of unsaturated soils. With the introduction of the effective stress concept, the behavior of saturated soils could be clearly understood and the basic principles of the saturated soil mechanics could be established. The effective stress principle states that the strength and volumetric behavior of saturated materials are exclusively controlled by effective stresses. Constitutive models for saturated materials of different types are all based on the effective stress principle. Later, the Critical State theory combined the strength and volumetric behavior of saturated soils in a simple and powerful constitutive model. A great number of models for saturated soils are based on the critical state theory. Things went not so smooth for unsaturated materials. More than fifty years ago Alan W. Bishop proposed an equation for the effective stresses of unsaturated soils. However, this equation was severely criticized because it could not explain by itself the phenomenon of collapse upon wetting of soils. In addition, Bishop’s effective stress parameter χ showed to be extremely elusive and difficult to be determined experimentally. Given these difficulties the use of the so-called independent stress variables (mainly net stress and suction) became common in unsaturated soil mechanics. Different equations for the strength and volumetric behavior of soils were proposed and the theory for unsaturated soils became distant from that of saturated materials. The Barcelona Basic Model represents one of the most simple and completes models within this trend. The Barcelona Basic Model enhanced the Critical State theory to include unsaturated materials and give a plausible explanation to the phenomenon of collapse upon wetting. This model proved that this phenomenon could only be modeled if in addition to a volumetric equation, a proper elastoplastic framework was included. But then, the simulation of some particular phenomena related to the strength and volumetric behavior of unsaturated soils, appeals for the inclusion of the hysteresis of the soil-water retention curve and the hydro-mechanical coupling observed in unsaturated materials. The difficulties met in introducing these aspects into the independent stress variables models made it clear that a different approach should be considered. Then, quietly elastoplastic models based on Bishop’s effective stress equation started to appear showing its superiority by including the hysteresis of the soil-water retention curve and the hydromechanical coupling of unsaturated soils. And finally, the debate about the appropriateness of Bishop’s equation to represent the effective stresses for unsaturated soils is slowly coming to an end. This transformation on the construction of constitutive models for unsaturated soils is also leading towards a unified soil mechanics theory. This book shows how the effective stress principle can be applied to simulate the strength and volumetric behavior of unsaturated soils employing the same equations commonly used for saturated materials. 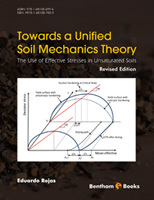 The book initiates with an analysis of the stresses transmitted to the different phases of an unsaturated soil when it is loaded. This analysis results in an expression for the stresses carried by the solid skeleton of the material. This expression can be written in the same terms as Bishop´s effective stress equation and leads to an analytical expression for Bishop’s effective stress parameter χ. However, the variables required to obtain χ cannot be experimentally determined. For that purpose, a network porous-solid model is developed which is able to approximately reproduce the structure of soils based on the grain and pore size distributions of the material. This porous-solid model is able to determine the allocation of water in the pores of the soil and thus simulate the soil-water retention curves of the material including the scanning curves. It is also possible to obtain the required parameters to determine the value of Bishop’s parameter χ and therefore compute the current effective stress. Nevertheless, the use of a network porous-solid model requires large memory storage capacity that cannot be presently found in common computers and thus the porous-solid model computer program becomes very slow. For that reason, a probabilistic porous-solid model is developed that reduces the storage requirements and speeds the simulations. Finally, an elastoplastic framework is developed to account for the volumetric behavior of unsaturated soils including compacted materials. This framework allows the simulation of the collapse upon wetting phenomenon and explains some other phenomena that could not be explained using the independent stress variables approach. All these developments lead to a general framework for the strength and volumetric behavior of soils including saturated, unsaturated and compacted materials. In that sense, a unified soil mechanics theory is presently on its way. The construction of knowledge is a collaborative task; that is why I would like to acknowledge all those who have contributed in one way or the other with their analysis, opinions, experimental results, comments and criticisms to this book. Some of them are listed in the references although, this list is not exhaustive. All graphical material contained in this book was carefully prepared by María de la Luz Pérez-Rea and Hiram Arroyo Contreras, Researcher and PhD student at the School of Engineering of the University of Querétaro, Mexico, respectively. Their help is greatly appreciated. The author confirms that the eBook content has no conflict of interest. Carlos Javier and Sonia Itzel, who have showed me the pleasure of shearing and enjoy each other.